César Moro’s Adorée au grand air (1935). Source: The Getty Research Institute. Automatic drawing, games, rubbings, collage, and dreams are all chronicled in the spectacular Drawing Surrealism show closing today at The Morgan. 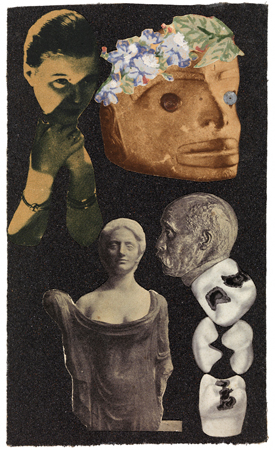 It’s an encyclopedia of what you can do with a scissors and pencil and demonstrates that these forms of play were critical to the most famous Surrealist works by superstars Ernst, Dali, Masson, and their European colleagues. Some of the off-the-wall creations born out of the Surrealist’s drawing games eventually made their way into big-time oil paintings. The curators also contend that the monochrome grey-scale of some famous paintings is actually a tribute to the importance they attached to charcoal and pencil media. The show, co-organized with the LA County Museum of Art, is the first time that Surrealist drawings have been the subject of an exhibition, and curators make quite the case for drawing technology transfer by showing us how these techniques (especially collage) spread to the rest of the world. One of the genuine revelations is the work and importance of César Moro, a Parisian-trained Peruvian who brought Surrealism to Mexico and the rest of Latin America. 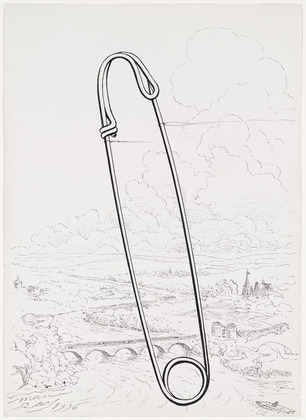 You can’t help but be struck by the forerunners of Pop: Man Ray’s Safety Pin sure looks like a precursor to Claes Oldenburg’s 1970s Clothespin, and there’s no question about the influence of Eduardo Paolozzi’s 1940s Surrealist-influenced collages: He and Richard Hamilton invented Pop Art in Britiain. This entry was posted in Art, History, Museums and tagged art, culture, drawing, museums, video by mssusanb. Bookmark the permalink.